Fly through the sky high in the tree tops and sore over canyons. 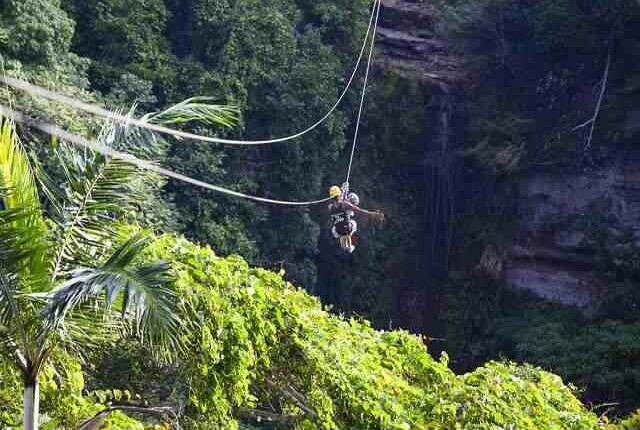 This zipline trip will get the adrenaline going! 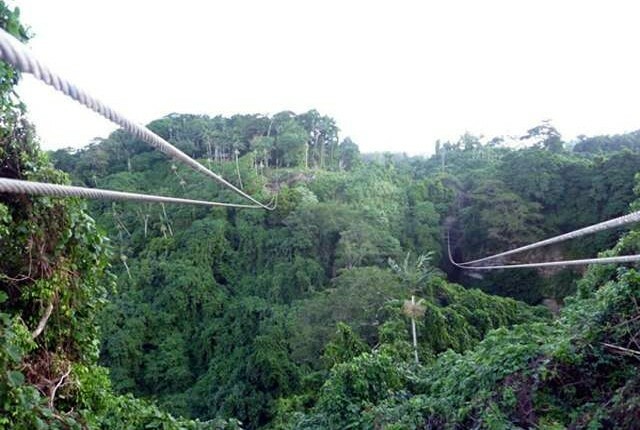 With six ziplines and two suspention bridges in the bush above Mele village, it’s a fabulous way to see the countryside…and get a rush at the same time. 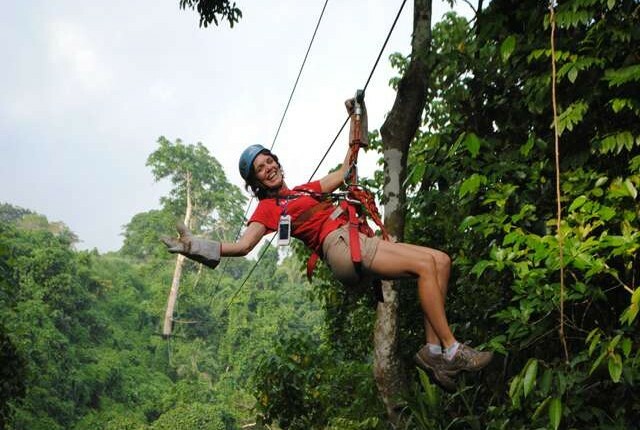 You will get spectacular views over the Mele Bay whilst zipping back and for the across ravines. In the wetter months of the year a waterfall runs through the course too. If you are of average mobility and strength and in reasonable health you will love this trip. Kids from 4 years old and adults to 89 (and under 130kg) are all welcome. Suitable clothing to wear a harness and closed secure footwear. Bring your camera and a glasses strap if you have prescription glasses. If you are taking photos with your iphone it is handy to travel with a case and lanyard that you can hang around your neck so it doesn’t drop. Swimmers/bathing suit if you are getting dropped off at Cascades or Hideaway. Free transfer and pick up from our Ticket booth at Nambawan Cafe (No.1) on the seafront in town next to Vanuatu Helicopters and Big Blue Dive. We do pickups at 10am and 1:15pm and return approximately 2.5 to 3 hours later. We have a free transfer and pick up from our Ticket booth at Nambawan Cafe (No.1) on the seafront in town next to Vanuatu Helicopters and Big Blue Dive. We do pickups at 10am and 1:15pm and return approximately 2.5 to 3 hours later. 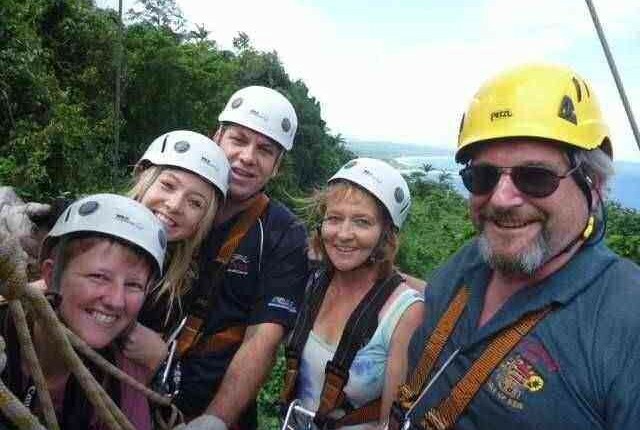 Tours are conducted at the Summit Gardens in Mele Bay close to Port Vila. If you are not taking advantage of the free pickups, please be at the Summit Gardens Car park at 10:45am or 2pm.